​We welcome you to our Christian community. We are honored and blessed with your participation in the Divine Liturgies. We invite you to raise your hearts and minds in praise to God. Remember that our hearts and our Christian families are the pillars of our church. Молитва "За Україну і український нарід"
Цю молитву склав Слуга Божий митрополит Андрей Шептицький, особа великої святості і глибокої життєвої мудрості. Please continue to pray for our Ukrainian Greek Catholic Church and Ukrainian nation during this very difficult time. Support those opposed to restrict the expression of religious and other basic freedoms in Ukraine. ﻿Video broadcast from the Ukrainian Catholic Parish in Woonsocket, RI for those of our brothers and sisters that can not attend the Divine Liturgy due to their health conditions. Baptism - Arrangements for baptism are to be made in person at the Parish Office. Please call for an appointment. Marriage - Arrangements for marriage are to be made at least 6 months prior to the wedding date. Please call for an appointment. Sick Calls - To arrange for Sacraments for the elderly and sick at home, please call the Parish Office. Please advise of any hospitalization. Bulletin Notices - Notices for the bulletin must be e-mailed or provided in writing by 8:00PM on Wednesday of each week to be included in that week's bulletin. Confessions are heard before each Divine Liturgy by request. Special Share in the Eucharist (Bread and Wine) - Donations are $20.00 per week. Donors/intentions will be listed. Eternal Light - Donations are $10.00 per week. Donors/intentions will be listed. Altar Candles - Donations are $10.00 per week. Donors/intentions will be listed. Bulletin - Donations are $5.00 per week. Your business card will be listed. As a friendly remainder to our parishioners and friends who wish to light candles for the health or in memory of their loved ones, the symbolic donation is $1.00 per one candle to cover the cost. Planned and overseen by our art and music directors, Julia Nesteruk and Lesya Rudyk, this dynamic Sunday Children's Program reaches out to the youngest in our church and in our community, creatively communicates the Gospel of Jesus Christ, encourages involvement and develops responsibility in the community, establishes a strong connection with the cultural heritage, and creates a vibrant parish through greater children's involvement. For more information and to enroll your children, please contact either Fr. Paul or Julia Nesteruk and Lesya Rudyk directly. It’s estimated that 90% of car seats are installed or used incorrectly. Don’t let yours be one of them! Once your seat has been purchased and installed according to the manufacturer's user manual, visit either the SafeKids website or the SafeCar website to locate a certified child car seat technician/inspector. They can check your child's car seat installation and make sure that you know how to install and use it correctly. Please contact Adrian Mishtal if you need assistance with setting up an appointment or are looking for additional information and resources. Summary of important child passenger safety information is located on our website, CARSEAT.ORG page, as courtesy of Stephanie M. Tombrello, L.C.S.W.,CPSTI, Executive Director of SafetyBeltSafe U.S.A. The School Board and Parent's Committee of St. Michael's Ukrainian School of Hartford, CT welcomes all students age 4 through 16 (grade 11) for the 2016-2017 school year! Saturday school hours: 9am -1pm. St. Michael's Ukrainian School operates under the guidance of the Educational Council of the Ukrainian Congress Committee of America. The goal of our school is to educate our students in national and christian traditions of Ukraine. Please contact our school office @ (860) 547-0858 for more information regarding school calendar, schedule, and programs. Click here to go directly to the school page on our website. Remember St. Michael's Ukrainian Catholic Church in your will. 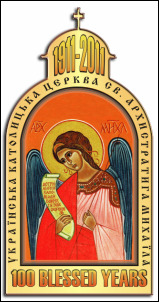 Copyright © 2013-2018 St Michael The Archangel Ukrainian Catholic Church, Hartford, Connecticut, USA. All rights reserved. Site powered by Weebly. Managed by Namecheap.